This is an enhanced model of the KOFLOC Precision Needle Valve Model 2412 (see page 102), which now incorporates a multidial that allows the user to set desired flow rates by dial operations. This valve makes the most of the rotationto-flow linearity and repeatability performance of the 2412 needle. 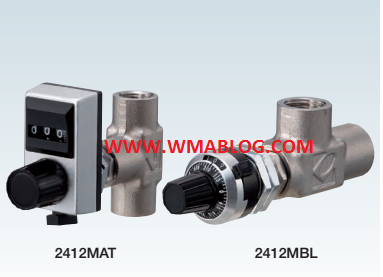 1.Since a precision needle valve usually has superior flow characteristics and repeatability, it can be used in place of a needle valve flowmeter. 2.Wide variations are available for both the needle valve (Type T,Type L, and so on) and the multidial (Standard Type, Round Type,and so on). Note: No scale calibration is required for the multidial.